Why Concrete should be the Foundation for Every Building. Concrete has a long and healthy history, from the Egyptian pyramids to the Colosseum, this material has withstood the test of time. Concrete does not rust, rot, or burn, doubling or even tripling the life span of most building materials. But, where concrete beats out all other materials is its thermal properties. Homes built with concrete walls, foundations and floors are extremely energy efficient. With the right equipment in place, concrete is extremely effective in keeping homes cooler in the summer and warmer in the winter. So, if you are looking at building an energy efficient home, it should always begin with concrete. Recognizing these natural properties in concrete, founder of Termobuild, Jack Laken sought out ways to maximize the green story of this efficient material. The solution: integrating hollow core slabs that would in turn be used to store and eventually release energy. Unlike other energy harvesting features, the cost to using this type of flooring and ceiling are minimal. Why? 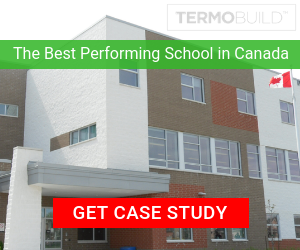 Because,Termobuild’s solution works with the materials and equipment that would already be in place. Large amounts of energy, both heat and cooling, can be stored within the hollow core slabs of a TermoBuildbuilding and utilised later, which leads to very energy efficient buildings. This includes the ability to harvest and store waste energy from bodies, appliances and lighting. As an added benefit, building structures can take advantage of off peak hours, using the HVAC systems during the less expensive time, and harvesting and storing the energy for daytime release. With the mantra doing more with less, Termobuild’s energy conservation begins by activating the dormant concrete floor. The focus instead of simply conserving energy, why not use the flooring to both harness and store waste energy? The system is paired with a variety of features including sensors, energy harvesting and air ventilation keyed to outdoor temperatures. Overall, shares John Florian, Manager, Facility Central Services, Husky Injection Moulding Systems, Termobuild is a very simple concept that has effective and efficient results. The system acts like a battery, harvesting and storing energy, until it’s needed. In places, like Chennai, India, where Husky Injection Moulding Systems installed the Termobuild solution, this system has maintained an ideal climate even during low periods (up to 2 days) of brown outs. When it comes to looking at energy efficient, sustainable solutions, sometimes the best ones are right in front of you. Concrete continues to be one of the most efficient foundations when building a passive home. Using Termobuild’s floor and ceiling system can take the building to the next level, storing energy, for a carbon neutral tomorrow.